Image Comics, the leading publisher of creator-owned comics, continues its mission to bring comics to readers around the world by announcing today that Image Comics single issues and collections are now available on Google Play! Founded in 1992 by a group of best-selling comic creators—including Todd McFarlane, Erik Larsen, Jim Valentino, and Marc Silvestri—Image Comics’ legacy boasts numerous New York Times bestsellers and Eisner award-winning comics and graphic novels, including the zombie phenomenon THE WALKING DEAD created by Image Comics partner Robert Kirkman, upon which the hit AMC TV series of the same name is based, the science-fiction epic SAGA, and the pre-apocalyptic western EAST OF WEST. These hit titles, along with more than 40 others for a grand total of over 500 releases, will be available to buy immediately for Google Play customers. Image Comics is dedicated to providing digital choices to its readers and making comics and graphic novels available wherever they may want to read them. 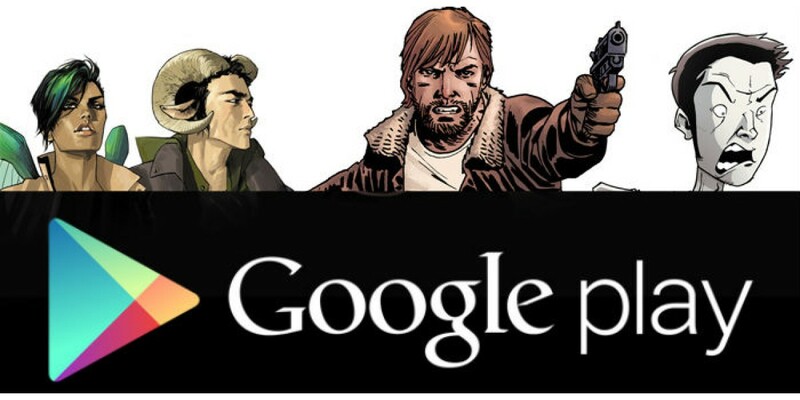 Thanks to the innovative reading experience provided by Google Play Books, comics fans on Android devices such as Nexus 7 and Nexus 10, one of the fastest growing customer groups, will be able to read and enjoy their digital comics all within the Google Play ecosystem, as soon as they are released in print. To celebrate the launch of titles available on Google Play, Image Comics is offering the first issues of the popular THE WALKING DEAD, SAGA, CHEW, INVINCIBLE, and SUPER DINOSAUR series for free to Google Play customers. The addition of Google Play expands the digital offerings of Image Comics, which also include Comixology, Apple iBooks, Amazon Kindle, and DRM-Free direct downloads available on the Image Comics website at imagecomics.com. For more information and to browse the Image Comics catalog on Google Play.